This is the nth time I'm making this. This one really impress many and surprisingly it is very simple. I got it from WokkingMum again and again, it is a no-fail recipe. Worth a try and really fits well when you're in a hurry. I twist her recipe and got myself this and this one serves 5. 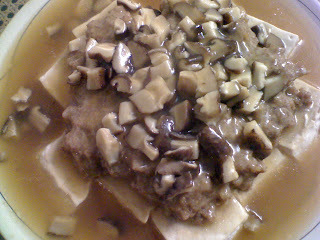 Soak 5 Shitake mushrooms in hot water for 30mins and simply cubed it (optional). Prepare one block of silken tofu, water drained and lay it on a plate. Mix together the two portion below in separate bowl. Place Portion A on top of the tofu. Steam on high heat for 20mins. Drain all excess liquid from the plate. Pour all Portion B into pan and the cubed mushrooms. Bring to boil. Add in cornflour mixture until it reaches desired consistency. Stir in spring onion, toss a little and off heat. 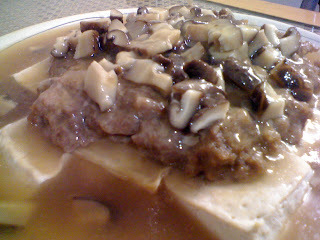 Even without the mushrooms, it still taste very good. Sometimes, I add in a little fried dried shrimps or small prawns for the extra bites!